Koufuku Graffiti plays well to Studio Shaft's strengths featuring beautiful stylization and a plot that, while light, is also surprisingly touching at times. It also features frequent food-based fanservice which may be a good or bad thing depending on what your preferences are. It's definitely recommendable to someone looking for a good "cute girls doing cute things" show. Koufuku Graffiti has a simple setup even for a feel-good slice-of-life anime. What makes it work is how smoothly it builds from its foundation. It mostly follows Ryō Machiko’s middle school life which (despite the fact that she’s attending an art academy) mainly revolves around food, family, and the many ways they go best together. 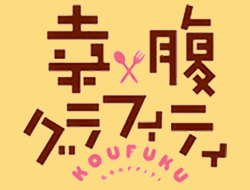 In more or less following a slice of one character’s life (instead of a group of 4 or 5) Koufuku Graffiti progresses by slowly developing Ryō’s situation, rather than merely mess around with the nuances of whatever club or activity was chosen to be the focus like many other shows in this genre. Of course, cooking and food in general are still explored in a plethora of ways, it simply isn’t all that’s going on. Food is what ultimately brings everything together, but it’s not usually the theme, rather it’s the scenic pathway that leads to the theme of each specific episode (though the weaker episodes lack this). Even takeout pizza gets special treatment in this anime. Living alone since her grandmother’s death, Ryō initially just cooks out of necessity and with little inspiration outside of the memory of her grandmother but comes to learn that food can be much more than sustenance. She is often accompanied by her cousin Kirin Morino, whose outward passion and energy balances out Ryō’s typically reserved demeanor and provides a solid base for just about every situation and character they interact with to bounce off of. In general, the more recurrent characters of Koufuku Graffiti appear shallow on the surface unless you pay close attention as they do develop slowly & lightly over the course of the show. It covers nearly 3 years’ worth of time in 12 episodes, and while the changes are mostly quite small they are noticeable as a whole. Meanwhile the side characters are quirky enough to fill their roles well and add to the scenes they’re in rather than merely be present in them. The main story itself (yes, there is a main story) is light but plucks at the heartstrings surprisingly well. The anime takes place a while after Ryō’s grandmother’s death, but a considerable portion of it focuses on Ryō learning to become more independent and overcoming her remaining melancholy… through food and cooking, obviously. Rather than have the parents not show up in the story because “who cares about the parents?”, Koufuku Graffiti makes a point out of Ryō starting out almost completely alone in the beginning, which strengthens the overall theme of food, family, and friends going best together. Sometimes it’s the main focus of an episode, sometimes it hardly comes up at all. Disclaimer: Probably the most mild Koufuku Graffiti eating scene. Back when it was airing this anime was better known for its highly suggestive food-eating scenes. Viewers who don't enjoy watching food or eating could find it to be a turn-off for them. Then again, if fanservice isn't your thing you'll likely find it preferable to the standard body-based variety, which isn't completely absent here but is mostly done away with in favor of the food-based fanservice. It doesn't detract too much from the rest of the show (in fact sometimes it's funny in context) but it is consistent and takes a piece of each episode, so it's effectively well animated filler for those who have no particular interest or disdain for it. As mentioned before this show plays well to Studio Shaft's strengths. The animation & picture quality is great for the most part. It’s vibrantly colored (expect when it shouldn’t be, and the desaturated portions are given just as much care), smoothly animated, and the CG elements rarely stick out. The voicework, sound effects, and music are all well done, but more importantly it's all stylized in just the right way. Nothing really felt out of place and all the elements worked together towards creating a colorful and touching experience to make the whole greater than the sum of each individual part. If Koufuku Graffiti were a food it would be angel cake; not very nutritious or complex, but light, soft, and full of good feels. If the food-based fanservice doesn’t bother you too much you're likely to enjoy it.